For years California has derogatorily been referred to as The Land of Fruits and Nuts. We will ignore the derogatory meaning and focus on how this phrase can apply literally to our bounty of agricultural products that feeds the world and yes, we embrace alternative thinkers, lifestyles, and diets. As a native Californian this makes me proud. As a business owner in this beautifully crazy state it means we have to be educated on the varied needs of our clients. As a person who loves knowledge and exploration this makes me very happy. Fancifull has been located in the heart of Hollywood since 1987. Being centered in and catering to the entertainment industry has lead to interesting requests. We have watched diets and designs change dramatically over the three plus decades we have been here. Evolution is a key to survival, so we dedicate ourselves to keep up with trends as well as realizing when trends morph into lifestyles. 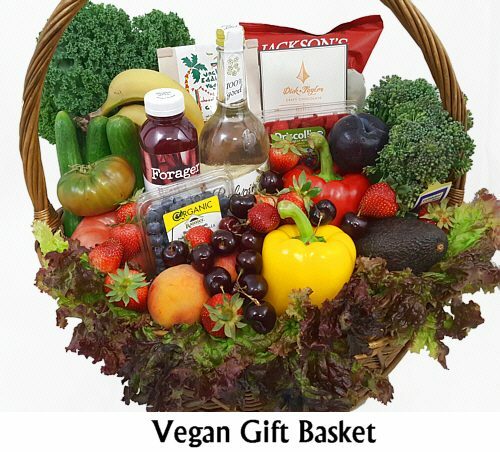 Pretty much every gift basket we design will have something that is vegan or gluten free, especially if it is designed for a group. Let’s go over the various diets briefly so we all understand them better and see how they can be deliciously incorporated into the perfect gift basket. Vegan is hugely popular. This is a plant based diet with no animal products of any kind: no honey, no milk (as in chocolate too), sometimes no white sugar, no leather (as in containers). Keep it clean. This is not daunting at all. There is so much good food for vegans which is why it is so easy to do. We love hummus and our organic Flamous Falafel Chips as a start. Good dark chocolate works just fine as do most nuts and fruit as long as there is no coating that might have an animal based product like honey peanuts. Speaking of peanuts, peanut butter is fun! Uncle Eddie’s Vegan Peanut Butter Chocolate Chip Cookies are one of our favorite cookies in the shop. Once the package is opened you can’t stop until you are holding the package upside down to get the crumbs. We always focus on organic and sustainable which usually coincides with a vegan recipient’s viewpoint too. Our fruit is mostly organic bought from local farmers. We make most of our vegan gift baskets not in baskets at all but reusable or easily recyclable boxes to cut down on waste. We also have biodegradable cellophane to wrap them in. We keep it all as natural as possible since many vegans eat that way from a desire to have a more sustainable lifestyle. We are here to help them. From the Celiac Disease Foundation: Gluten is a general name for the proteins found in wheat (wheatberries, durum, emmer, semolina, spelt, farina, farro, graham, KAMUT® khorasan wheat and einkorn), rye, barley and triticale ( a cross between wheat and rye). Gluten helps foods maintain their shape, acting as a glue that holds food together. Celiac Disease occurs when the ingestion of gluten causes an autoimmune reaction that damages the small intestine. The body just can’t handle it. Some people choose gluten free not because they have celiac disease, but to cut inflammation in their joints or they feel better without it in their diets. It can be hidden in beer, crackers, baked goods and even snacks with coatings that may have a flour base. No problem. Fancifull can deal with that. We generally keep out foods that have been processed in facilities that also produce wheat products because cross contamination can occur. Luckily there is a large variety of great food that can be sent. Cheese has no gluten, neither do most potato chips, nuts, popcorn and chocolate. 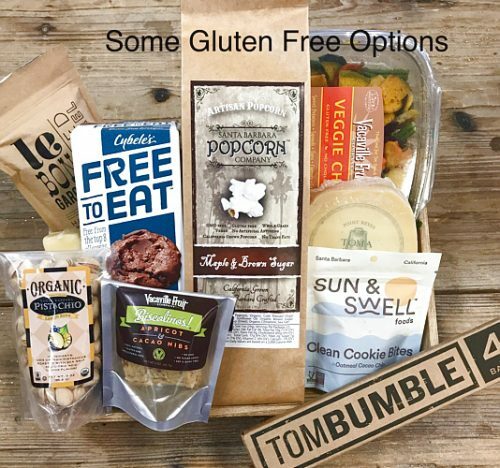 We carry Cybelle’s Gluten Free (and Vegan) cookies that are as good as any cookie with or without gluten. Fruit, tea and coffee all work well for a gluten free diet. The falafel chips we use in our vegan baskets also work in gluten free, along with hummus or salsa. Adding fresh flowers or a plant is a good alternative to just food. At Fancifull we don’t believe in limits to our creativity! Kosher foods have to conform with Jewish dietary laws. They carry symbols of certification that distinguishes them as such. There are foods that are never kosher such as pork and shellfish. We do have kosher cheese and wine in our shop as well as a host of other kosher foods. Our Shiva Condolence basket is filled with fresh fruit and kosher foods to send along with words of comfort. We keep up on the laws as much as possible and are aware of times when those who are orthodox can’t receive gifts due to the Sabbath – we don’t deliver after sundown on Friday and all day Saturday to respect their laws. Not all of the Jewish faith keep kosher, but we get this request often because if one isn’t sure it is better to be safe than sorry. Our favorite kosher food is the Cinnamon Babka and the Black and White Cookies from Lily’s Bakery. We just love our Kosher Classics which has both of these items as well as some coffee and great Rugelach! Our job is to make both our clients and their recipients happy. Fancifull is built on trust – that we will send a quality gift, get it there on time, and fill it with amazing food and gifts that the receiver will love. It takes a bit of research, which we jump into with passion. It helps us understand this world and the people who live in it a bit better and that is a win for all concerned.